Putting bread into a salad isn’t a revolutionary idea—panzanella salads have long graced the menus of every wicked hip restaurant. Hell, salad bars across the country fill containers with buttery, processed croutons on the daily. What can be revolutionary is using the best of your local bounty to push traditional recipes. As we enter the final doldrums of summer produce, it may not always be possible to find six beautiful tomatoes, or three perfect cucumbers. It’s important to stay nimble—to embrace what your farmers market or CSA gives you. That is what this stone-fruited Fattoush is all about. 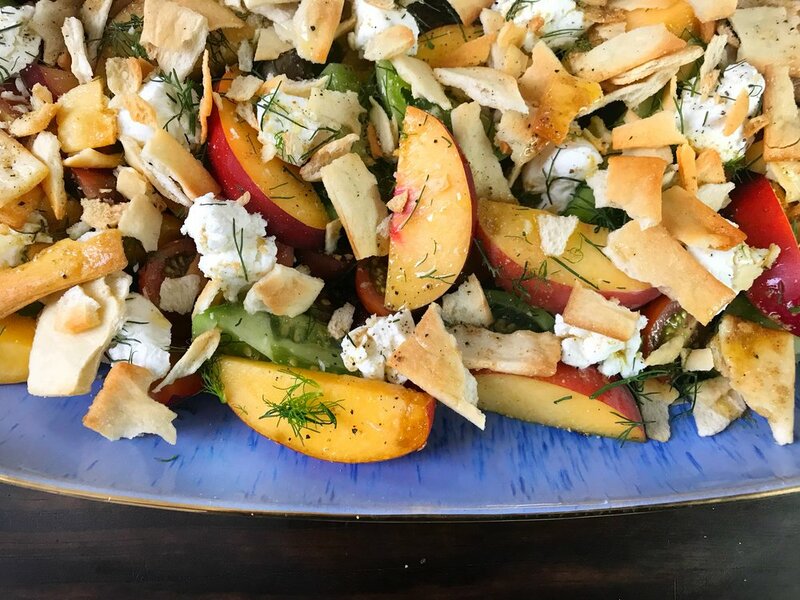 A mixture of stone fruit and tomatoes, this fattoush salad highlights summer’s bounty without relying on only one ingredient. The tomatoes don’t look so good this week? Skip them! Only two ripe nectarines? Add more tomatoes! Or peaches! Or plums! This is a general guideline to the summer salad of your dreams. Follow the directions closely once, and then make it your own time and time again. Stone fruit? Check. Tomatoes? Check. Hello Fattoush. Never had a fattoush salad? It's the Lebanese version of a panzanella. Or maybe a panzanella salad is the Italian version of fattoush? Either way, it's a delicious salad traditionally made with tomatoes and flatbread. The key is this: Use what your market gives you. You can feel free to switch up the ratio of stone fruit to tomatoes. You can even get rid of one ingredient entirely—though I think the combination of sweet, velvety-textured stone fruit and bright, acidic tomatoes is heavenly. Drink: Sparkling rosé or a light Grenach-Syrah-Mourvedre (GSM). Whisk together garlic, lemon juice, red pepper, and coriander. Then, slowly whisk in oil. Adding the oil in slowly allows the mixture to emulsify! You can keep those stems in for texture, if you like! I go for small wedges, but your preferred shape is just fine. Layer tomatoes and stone fruit along the bottom of a large platter. Drizzle the fruit with coriander dressing and top with dollops of fromage blanc, dill, and crushed pita chips. Bring it to the table looking beautiful and untouched so everyone can ooh and ahh. Then, mix the entire thing to integrate the pita. I don't really get this whole emulsify thing. Basically, do you want your dressing to be thin and watery, or rich and creamy? An emulsion is blending together two ingredients that don't mix—oil and vinegar, for example. If you add oil into vinegar too fast they will separate immediately. By beating them together vigorously with a slow stream of oil, you're able to get delightful texture by breaking down the oil's fat molecule and letting in acid. We served this fattoush with an end-of-summer feast that included some grilled steak and this corn salad. The pita chips can get soggy early, so it's best to make this salad just before serving, or mix everything together a couple hours in advance, if you must, and add the pita chips at the last minute. Fennel fronds! Though, I realize fennel is possibly more divisive than dill. You could also use parsley, cilantro, or any fresh herb.